Succulent crab stuffing is rolled into ham. Crab Stuffed Ham Rolls are not only delicious, but come together quickly to appease your most hungry family members after a food coma. Are you like us, and have ham for Easter? And, are you like us in that we have TONS of leftover ham after Easter? Don’t get me wrong. I’m not complaining. We LOVE us some ham! Sandwiches, with scalloped potatoes, in soups, pasta, or stir fry. Yes. That’s right. I said ham stir fry. Not to worry. I’ll be sharing that recipe soon. I’m picky about my ham. To me, ham has…well, it has flavor. It also has a lot of salt. Ham is SUPER salty to me. And then there’s usually the glazed coating on the outside that’s a nice offsetting sweet flavor. But if you were to ask me what ham tastes like for Easter? I’d be hard pressed to really describe what I ate. Enter the Whole Foods Market ham. Now, you can head to their website and order your Easter ham or meal today. I’d highly recommend it. Their food is off da hook!! The wild and basmati rice is amazing, the bacon and thyme braised onions are super sweet, and, well, we all know how I feel about asparagus. No offense Whole Foods Market! Seriously. I’m not kidding. Their meals taste like I just sat down to a home cooked meal from my family. Their ham is no exception. I am forever spoiled. I don’t think I can eat any other ham after tasting the Whole Foods Market Ham. It’s not super salty. It actually has a pork flavor and tastes like I always want a ham to taste like. For me, a ham should taste like pork. Like biting into a cured, baked, and sugar glazed pork roast. That’s what a ham should taste like to me. The Whole Foods Market ham tastes just like that; it has delicious pork flavor that I can actually taste is pork. And, well, y’all know my history with holiday meals. No? We have two 2-legged people in our family and two 4-legged people in our family. The smallest ham (turkey, rib roast, etc) I can usually find is 12 pounds. Regardless of the protein of choice for that holiday. This means we have TONS of left overs. I have at least 2 ham hocks in the freezer. I know there’s at least 2 packages of sliced ham and maybe some diced in there, too. In this house, you have to be completely creative with your leftovers. I’ve made ham and cheese enchiladas, ham and cheese strata, fried rice, pizza, pasta, soup, sandwiches; you name it! I’ve probably made it with ham. This creation, however, was my husband’s idea. He has some pretty good ones! He says to me, “We should make a …. Wait. We can’t.” “Why not?” “Well, I was going to say Oscar, but you don’t like asparagus.” I then went on to insist that we could still stuff ham with crab filling and it would be delicious. And let me tell you, with this Whole Foods Market ham these Crab Stuffed Ham Rolls are AH-MAZING! Not only are they pack with sweet, lump crab meat, but they also have cream cheese to make them creamy, Parmesan cheese for that little salty cheesiness, and some red onion and spices for flavor. I couldn’t get enough of them and just kept having to test taste many to be sure they were perfect. It’s a sacrifice I’m willing to make for my readers! I don’t want to lead you down the path of mediocre. So, snag a few slices of ham and whip up some of these ham rolls for your family to nibble one while they wait for you to heat up your Whole Foods Market Easter ham or meal. How do you serve up your leftover Easter ham? Do you even have any leftover Easter ham? I know there will be not leftovers once you order your Easter ham or meal today! Combine the cream cheese and mayonnaise together with a fork until smooth. Stir in the red onion, Old Bay, garlic powder, celery flakes, and black pepper. Carefully fold in the crab. Be sure not to separate all the chunks of crab meat, but breaking up some of the crab will make the rolls easier to make. Spoon about 1 to 2 teaspoons of crab mixture into a piece of ham and carefully roll the crab mixture up in the ham and secure with a toothpick. Place on a baking sheet coated with cooking spray. Continue with the remaining crab mixture and ham slices. Bake at 350 for 20 to 25 minutes or until the crab mixture is melted and bubbly. Allow to cool slightly before slicing the rolls in half and serving to your hungry family. Disclosure: I have a partnership with Whole Foods Market and was compensated for my work, but all words and opinions are mine. I would love to serve the Beef Lasagna! My hubby loves Italian food! So do I!! And lasagna is my hands down fave! They used to call me Garfield when I was growing up. It was always the meal I asked for on my birthday. Well, don’t these little nibbles look positively delicious!?!? I absolutely LOVE Whole Foods. We have one a few towns over. I don’t get to it as often as I’d like…I wish I lived closer. If I did, I’d be in there all the time!! When I am down that way, I always stop in. These crab stuffed ham rolls look like a great way to use up some extra Easter ham! We love ours, too. Could spend hours in there not only shopping! Ours has a few eat in counters for like sushi and what not. Love Whole Foods Market! I want to run to Whole Foods right now and pick up some of that ham! It’s SO good!! Better than any ham I’ve ever tasted. I love whole foods and shop there all the time! I always buy my turkey for Thanksgiving there, but I have not tried their ham. I’m definitely going to have to give it a try, because it sounds absolutely delicious! 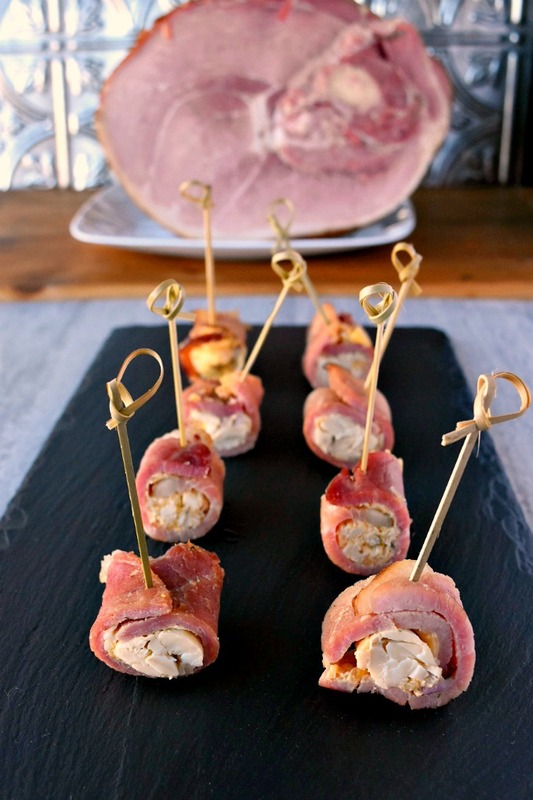 And these crab stuffed ham rolls look amazing, such a great way to use up leftover ham! I’m always looking for ham leftovers. We eat ham often, but I’ll be getting them from Whole Foods from now on. Delicious! That looks delicious! We do our big deal on Saturday and try to take Easter Sunday easy. This will be a great thing for us to munch on as we recover and enjoy! That’s a good idea!! Both, actually. You always have to have small eats after the food coma. Perfect dinner right here! I love how and crab, too. This is a great combo! If it comes from Whole Foods, I know it’s delicious! These ham rolls look delicious! They’d make a great appetizer too! What genius way to use up ham!! Never a full meal afterwards but love the snack for the next day! Lots of Easter ham going to be leftover!! We always have LOTS of leftover ham. This is the most creative way to date thanks to the hubs. It was his idea!